While news about the Islamic State in Iraq and Syria (ISIS) and the Greek debt floods the airwaves, other hotspots simmer just out of view. Like Iraq, three of the following four situations have had significant, recent international intervention, and all threaten to be headlines – again – in the near future. In 2011 an international coalition helped rebels evict Muammar Qaddafi, and people danced in the streets. Today, Tripoli is in Islamist hands, and the country is a jigsaw puzzle. Libya currently has two functional capitals, making it virtually separate nations. The Islamist militia “Dawn” controls Tripoli and, in the east; the internationally-recognized government is based along the coast in Baida, supported by a brigade of the Libyan National Army. The plot thickens: Between the polarized east and west are interspersed Islamist groups, intent on carving out a place in the new Libya, and a say in Africa’s largest crude oil reserves. This Tuesday there was a clash between Dawn and the Baida-based troops on the coast near Sidra, which exports roughly a third of Libya’s oil, but which is now shut down due to the fighting. Islamic State fighters have joined the fray in Tripoli, claiming responsibility for the attack last week on a luxury hotel that killed nine and, in the past month, car bombs directed at assets of the recognized government. Last July, as fighting burned jetliners into hulking wrecks at the international airport and fuel tanks exploded, foreign embassies evacuated to Tunisia. As the country smolders, the U.N. now urges a ceasefire. Two years ago, French troops helped Malian counterparts banish an Islamist force to the country’s barren north, and peace talks were underway to accommodate the long-marginalized Tuareg people. Yet disorder is revisiting the remote northeast: This last week U.N. peacekeepers killed three people during a protest gone awry, French troops killed 12 insurgents, and suicide bombers struck Tuareg positions. Mali’s insurgency has been a case study in weak government meeting well-armed rebels. The country’s remote north and east has been a low-level conflict for years. The pastoral Tuareg have insisted on running affairs in their traditional homeland, while officials in the capital, Bamako, cared little for them. In 2012 however the Tuareg had help: Islamic fighters with Al Qaeda in the Islamic Maghreb (AQIM) and looted arms from Libya’s post-Khadafi forces. When a Malian army post was overrun by the partnered Tuareg and Islamists, a determined army captain, Amadou Sanogo, took action. He deposed the president and took on the insurgents with a new playbook. When Islamists began soaking up territory, French troops arrived in January 2013 and pushed them back to Mali’s remote, northern reaches. A once domestic issue is now contested by multiple actors, many of them outsiders. French troops remain to thwart further threats, U.N. peacekeepers have spread out in the region, and surveillance drones are flown out of neighboring Niger. In addition, pro-government militias now seek to extend Bamako’s writ, mostly aimed at the Tuareg. Peace talks between the government and Tuareg are expected to continue in Algeria, with a buffer zone under consideration. Nigerians’ love for democracy will be tested Feb. 14, the date of their next presidential election. Incumbent Goodluck Jonathan, a southern Christian, bucked unwritten tradition in 2011 when he did not step aside for a northern Muslim to take the head office; related violence then killed 800. Four years later, the stage is the same but with more pre-election violence and rhetoric. A bomb razed an opposition office building last month. The governor of Rivers state, center of the country’s oil production, has threatened a parallel government if Jonathan wins the election. Last Monday, a suicide bomber narrowly missed the president at a campaign rally. Jonathan has other headwinds: The current budget assumes an oil price of $79 a barrel, so there will be shortfalls due to the sinking price. Since Nigeria depends on oil for some 70 percent of total government revenue, services will suffer, further risking social instability. In Haiti’s capital Port-au-Prince, there are no lawmakers. Parliament is empty, as are the offices of the chairs of the supreme court and central bank. President Michel Martelly, in office almost four years, has since mid-January ruled unchallenged. Last month Martelly failed to reach agreement with opposition lawmakers on elections, which meant parliamentarians, who check presidential power, no longer had jobs. 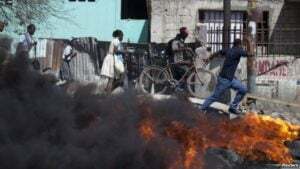 The stalemate is yet another frustration for Haitians still reeling from 2010’s devastating earthquake in the poorest nation in the Western Hemisphere. While 79,000 still live in tent camps near the capital, the political impasse has now stalled home building. Of the $13 billion pledged by donors, by 2013 $4 billion remained undisbursed. The honeymoon with Martelly was over long ago. Described variously as wanting to “destroy parliament” and corrupt, recent protests have called for his resignation. Many Haitians view as especially galling Martelly’s cozying up to former president Jean-Claude Duvalier, a symbol of past political repression and excess. The government has also imprisoned activists, intimidated journalists, and delayed elections. A national opposition uprising in December forced the resignation of the prime minister. Protests have also sprouted in recent weeks over fuel prices, which are mandated by the government. Residents pay roughly $4.30 per gallon, while the U.S. price is half that. In response the government pleads its massive debt arrears. Another indication of continued poor governance is that the U.N. Stability Mission to Haiti, MINUSTAH, has been in the country almost 11 years. After first arriving in 2004 to provide security for elections, the U.N. Security Council has renewed it several times. While the force has achieved key objectives, the Mission’s buy-in with a disillusioned populace has been falling for years. Further, many of the disenfranchised see the U.N. mission and international aid community as complicit with the president, since most residents have had little improvement to conditions and quality-of-life. With little evidence that ministries suitably address needs, the U.N. mission stays on, in a dysfunctional cycle-of-need. Except for Nigeria, these countries have occupied headlines as dysfunctional states before. The U.S. military has spent four of the past 20 years on operational or humanitarian missions to Haiti. 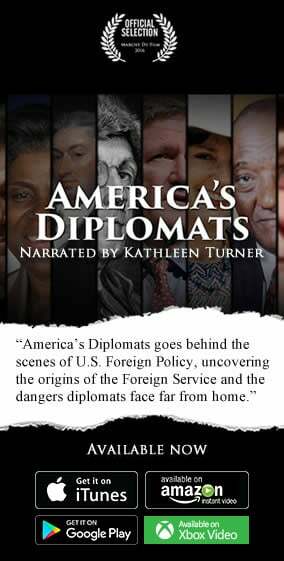 The development and diplomatic communities have habitually shaken their heads and wondered whether Haiti is a failed state since widespread poverty and unemployment persist, as does a seeming cycle of forced political takeovers. Mali’s recent threat from Islamic insurgents, some say, can be traced to the resulting power vacuum in Libya after Khadafi. Tribes that Khadafi supported in southern Libya now were adrift and decided to take their own territory, and ally in eastern and northern Mali with the Tuareg, nomads historically sidelined by Mali governments. International intervention, of course, as people debate across the globe, can have unintended consequences. The French would never have needed to fight in Mali, one argument goes, if the French had not helped remove Qaddafi from power. The same analogy roughly applies to Iraq, in the power vacuum created in the absence of Saddam Hussein, and the current travesty of ISIS. Foreign powers will say that strongmen were the greater evil; residents of those countries, where chaos then becomes everyday life, would likely disagree.